We’ve found the planet’s cutest animals and squeezed them inside this adorable title. 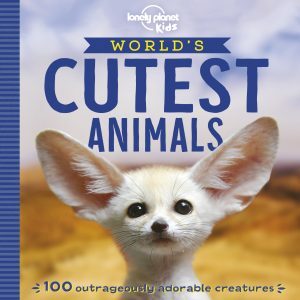 From fluffy pandas and penguin chicks to pygmy possums and inquisitive quokkas, discover a mix of family favorites and lesser-known critters, all accompanied with fun facts and big, beautiful photos! Starting from North America, you’ll travel through all the continents of the world to meet 100 outrageously cute creatures. Say a big “hello” to the fennec fox from the deserts of Africa, the northern pygmy owl from the western United States, the European hedgehog, Siberian chipmunk, the New Zealand fur seal, and the bearded emperor tamarin from South America. Includes endangered and nearly endangered species and information about how to get involved with different conservation efforts to help protect them.